The first step to making raspberry jam is to pick your raspberries on a hot sunny day, when they are perfectly dry and at their most fragrant. Then you must take them home straight away and make the jam immediately, while they are still warm from the sun. So reckons Hugh Fearnly-Whittingtsall, and who am I to disagree? It's just that it's an instruction impossibly out of reach of most. Who has a large berry patch within close distance to their kitchen, and really, how much difference can it really make? Well, let me tell you, I found out it's entirely true. To make truly great raspberry jam, that really is the first step. Find raspberries that have never been refrigerated. My favourite school holiday activity, in-between a very busy work schedule, is to get the children out picking fruit so I can preserve it in a few spare moments of a busy summer. It's been a dismal season for a lot of growers of soft fruit around here, not a lot of sunshine and plenty of rain. Cherries have spilt, peaches have rotted and raspberries gone mouldy on the canes. Not great for farmers, but great for jam makers who have the time to turn this less than perfect fruit to jam straightaway, (as it won't keep a minute so you really have to attend to it straight away). I see a bit of jam making in my future! This season saw a mad rush to the local raspberry farm, where we picked up the berries off the ground, that had been just shaken off the canes as there was no time to pick them for market before the rains came. (Left on the canes they'd go mouldy and spoil the remaining crop.) We only picked for 30 minutes and came home with a bounty of fragrant raspberries and the jam pan was filled and on the stove immediately. My raspberry jam is runny, as I'd prefer to cook it for less and use less sugar to keep that wonderful tart fruity flavour prominent, rather than make a too-sweet, stiff jam with the life cooked out of it. So if you don't mind that, the oven jam is delicious and worked a treat. One spoonful and I was instantly transported back to the berry patch on a hot summer's day. And to me that's what a good jam should do, capture that glorious fruity essence in a jar. Seems Hugh was right. Here are the instructions I used, not really a recipe as such. And if you ever do get the chance to pick raspberries in the midday sun, listen to Hugh and make them into jam straight away. You'll need equal quantities of raspberries and sugar. Tip the lot into a baking tray, stir, then bung in a 180C for 20 minutes. You don't want the jam to boil. Carefully remove from oven and stir until the sugar dissolves (this took about 10 minutes). Pour into sterile jars and seal. Constance Spry puts her sealed jars in a cool oven (90C) for one hour, which isn't a bad idea as an extra sterilisation measure. Although I didn't as Darina says you can keep this jam in the pantry for a year, which is rather unheard of in our house, that is raspberry jam lasting for a year. As a reward for our hard work. 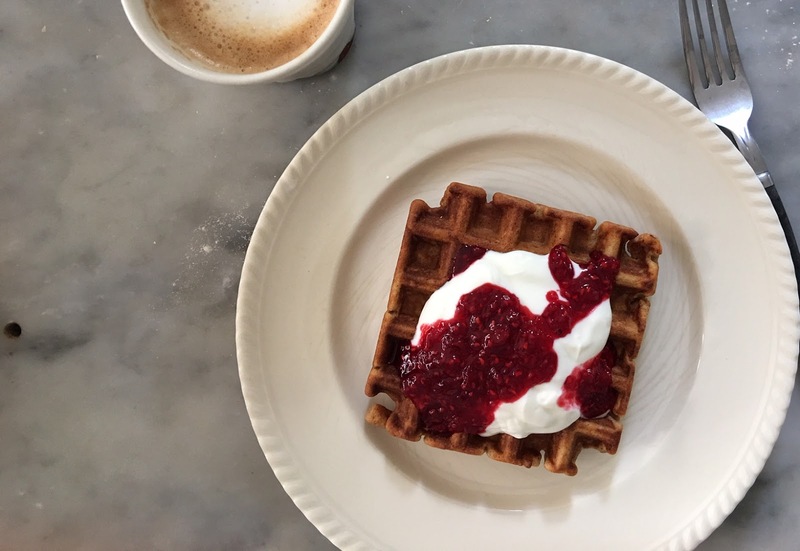 We made waffles and smothered them in warm raspberry jam. That looks divine, though my chances for picking raspberries on a sunny day are fairly limited. I'll have to take your word for it. I wonder whether leaving them in the sun for a day would have the same effect. Everything's better with a little sunshine, I say. You could try, that's for sure! People just know how to use things but not know how to make these things like this jam. informatic. Gorgeous! We're finally making the trip down to Tasmania from Brisbane next month - and picking fresh berries for the first time in my life is near the top of our 'to do' list. Our accommodation has a full kitchen so I'm going to give this jam a go. Thank you! Oooo can't wait to give this recipe a try! I've never made jam in the oven, only ever the raspberry jam recipe from 'Not Just Jam' (just received my own copy today in the mail - realised I was kind of hogging the library one). This is very true. We made raspberry jam out of raspberries that we bought off a grower (our own raspberries bushes only produced about 6 raspberries this year and are now on a final warning). This is the first time I had tasted jam that was so fresh and it took me a while to work out why it was so good. The lack of refrigeration is the key. Ha! I love that you have given your raspberries their final warning....there's a few things in my garden that could do with such a warning! I think you're right about refrigeration. I used to do this years ago but only heated the sugar in the oven. When the sugar is hot throw it over the raspberries. They immediately disintegrate into the sugar. Then keep it in the fridge and use it fairly soon as it doesn't keep long. Gorgeous on toast, cheesecakes or drizzled over ice cream.